Le Club AccorHotels has launched a promotion for stays in Benelux countries of Belgium, Netherlands and Luxembourg. Classic, Silver and Gold members can earn triple bonus points while Platinum members are eligible for quadruple ones for stays consumed between November 10 – December 31, 2016, and booked November 10 – December 15. Note that you must register for this offer to earn the bonus points, and you can take advantage of it an unlimited number of times. This is a very good offer for late fall stays in these countries and can help those that need some points to renew or reach elite status with Le Club AccorHotels. Remember that all the points earned will count toward elite status until the end of this year. 1. General Le Club AccorHotels terms and conditions apply to the Autumn colors in the BeNeLux offer and you must be Le Club AccorHotels member to benefit from it. 2. This offer entitles Le Club AccorHotels members with status Classic, Silver and Gold to benefit from earning bonus points x3and members with status Platinum from earning bonus points X4 for a stay in one of the participating hotels in Le Club AccorHotels Loyalty program. 3. This offer is valid for a member’s stay from 10/11/2016 to 31/12/2016 in one of the participating hotels in Belgium, the Netherlands and Luxembourg, and booked between 10/11/2016 and 15/12/2016. 5. Any consecutive stays (check-out and check-in same day) in the same hotel, will be considered as a single stay. This single stay will be eligible once to the Autumn colors in the BeNeLuxoffer. 13. Please specify the reference 48121 in all your communications with AccorHotels call centers or customers care services related to this offer. 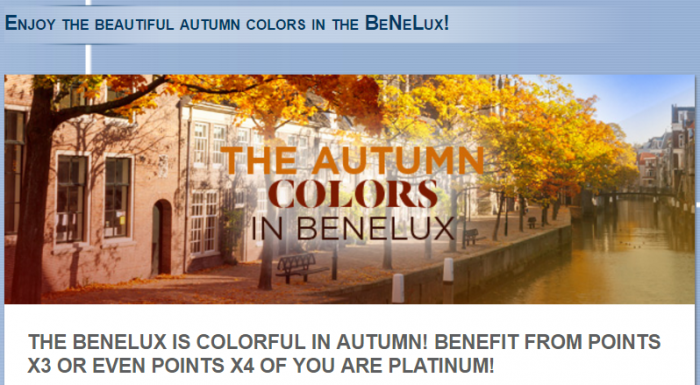 You must register for the Autumn colors in the BeNeLux offer before proceeding to the booking, to be eligible to the offer. Previous articleReader Question: SPG Lifetime Gold To Marriott Lifetime Gold Status Match?